A lot of people in Bohol and Cebu are in need of our help after the 7.2 magnitude earthquake that took place in 15 October, as many of them have not gone back to their normal lives and their homes in fear of another earthquake. 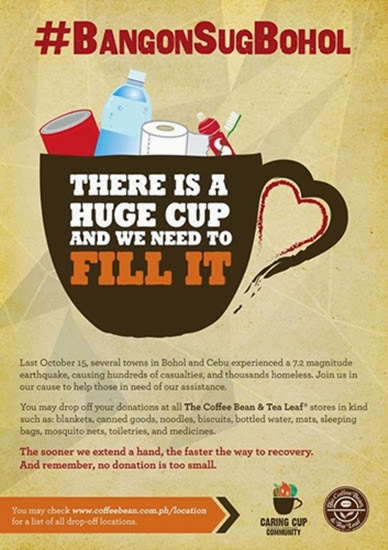 For donations in kind, including blankets, noodles, canned goods, mats, sleeping bags, medicines, biscuits, bottled water, mosquito nets and toiletries, you may drop them off at all The Coffee Bean & Tea Leaf branches. Kindly check out www.coffeebean.com.ph/location for the list of drop-off locations. Remember that no donations is too small. This entry was posted in announcement and tagged food for a cause on 24.October.2013 by admin.